All stores of the “Zurheide” family enterprise have celebrated freshness and quality for 40 years. This also applies to the new Edeka Center in the city centre of Düsseldorf. A new Silikal floor grants fancy and clean presentation. Silikal flooring in a concrete look was installed on a sales and catering area of approx. 11,000 square metres. Our customer, Storax Boden GmbH from Dorsten, could work in sections, since this Düsseldorf-based Zurheide site was built new in a former Kaufhof building. Enjoyment and aesthetics are the focus of the up-to-date sales presentations on two floors, to the principle “Freshness must be visible”. The concrete look is a perfect fit. What was also important: The floor can be reworked overnight, since the Zurheide team expects heavy use by many satisfied customers and eventful purchases. 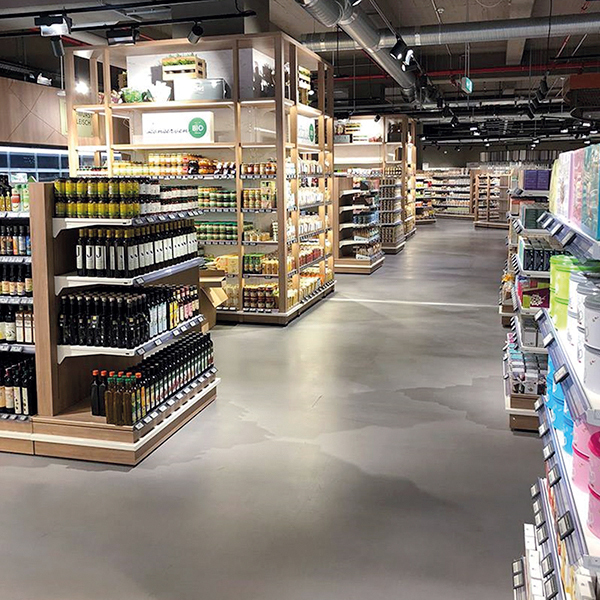 Preparation rooms such as bakery and butchery, as well as in the warehouse – on an area of around 1,600 square metres – people work on safe and hygienic Silikal coloured sand flooring now.